The Vodafone McLaren Mercedes F1 Team has had a successful first race of the season when you consider where the team was a couple of weeks ago during winter testing. Due to a solid performance of both Lewis Hamilton (2nd place) and Jenson Button (6th place) the team is second in the championship standings. “Second position is a great result. The car felt fantastic, really nice to drive, and I was able to look after my tyres throughout the race. To be able to apply pressure to Sebastian [Vettel] so soon into the season was massively encouraging, too. “I think we were competitive enough today to compete for the win. If it hadn’t been for the poor start, we could have been in the fight. So I think we should be excited. “I don’t really know what happened with the floor, but it didn’t feel too bad to drive. After the race I had a look at it, and it looked quite badly damaged. I was just glad to be able to bring the car home, I was nursing it. “Physically, though, that was one of the easiest races I’ve ever had. I came here feeling fitter than ever, so I’m looking forward to going to Malaysia, which is probably the toughest race of the year. “I’m also looking forward to seeing what additional performance we can bring to the next race. The engineers know where there’s more performance to be gained, and we’ll get it to the track as soon as we can. “I got an okay start, but I was surprised to see Vitaly [Petrov] up the inside – he got a very good start and forced me wide. Then I got stuck behind Felipe [Massa], because I got a very poor exit out of Turn 1, and that was the worst move of my race, because he was so slow and difficult to overtake. He slowed us both down massively. “I tried to overtake him around the outside of Turn 11. I was in front before we turned in, but he went really deep into the corner and pushed me wide so that I couldn’t take my normal line. “After my drive-through penalty I had to fight my way back – which was fun but also frustrating. I just wish I could have got the best out of it today, but at least Lewis did a good job. “We should be very happy with our pace though. We’ll have upgrades for the next race, but the car is still very new, and there are plenty of changes we can make to hone the package. 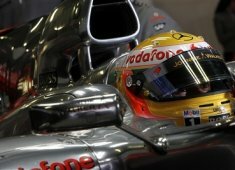 Martin Whitmarsh, Team principal, Vodafone McLaren Mercedes: “Early on, Lewis was more or less able to stay in touch with Sebastian, but once his car’s undertray had been damaged he was no longer able to keep the leading Red Bull in sight. Even so, he drove a great race, in difficult circumstances, to finish second today.